One of our best value heat sealers - efficient sealing in two easy steps! 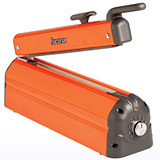 Superior polythene bag sealing in just a few seconds with this standard impulse heat sealer. Simply lower the arm, raise it again and the sealing is done! 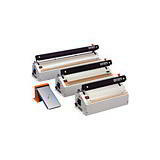 Certain models come complete with a cutter to trim off any excess material. These impulse heat sealers are compact, sturdy and reliable, and can handle over 100 seals per shift for consistent productivity. It has an attractive black finish with clear, easy to use controls to ensure precision heat sealing, while the specially designed element wire quickly applies heat, before the mechanism starts to cool the seal. When using your impulse heat sealer for the first time, we advise starting off by setting the dial to its lowest possible setting. Then keep increasing the heat bit by bit until you find the ideal temperature to complete the seal. Setting the temperature too high straight away may result in damage to the heating element and reduce the working life of your sealer. Don’t forget that if you subsequently try to seal thinner or thicker polythene, you should always start from 0, to make sure you get the lowest setting to complete the job. Please note: Impulse heat sealers with cutter are used with layflat tubing, to create custom polythene bags and trim off excess material. 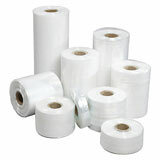 Heat sealers without a cutter are ideal for sealing polythene bags.